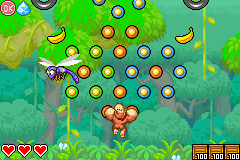 Tropical Treetops is an early level that takes place in a jungle in the Jungle World in DK: King of Swing. Being only the second or third level in King of Swing (due to it being unlocked at the same time as Contraption Cave), it is still introducing the player to the game, but it adds a few enemies, specifically Flitters, and a Bonus Barrel to show some new features. Other objects appearing in this level are moving pegs and tires. Additionally, it features a bronze DK Coin and a Crystal Coconut that is located in the Bonus Level. The level starts on the floor of a jungle and works its way up to the canopy. When Donkey Kong begins the stage, he is able to jump upwards to reach a set of pegs and peg boards. The first set of peg boards are placed around the area to shape out a square with a lone banana in it. A Flitter flies around the top peg boards here. The pegs above this area come in several different sizes and are placed close together. A Flitter moves around them. The pegs help the ape reach a single peg board at the top of the first section of the level with a banana on it. To the right of this platform is the platform leading to the second section. In the second section is a group of pegs placed behind a Flitter. Pegs that rotate are above these stationary pegs. Around the rotating objects are bananas and two pairs of tires placed on the left and right side of the section. On a platform at the top of the section is a Bonus Barrel, while on a platform to the right of it is the way into the third section of the level. 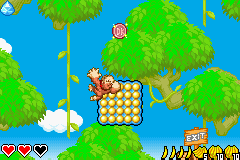 If Donkey Kongs makes his way into the Bonus Barrel, he end up in a bonus where he must travel along two sets of peg boards forming two squares to grab many bananas. If the bananas are all collected within the time limit, a Crystal Coconut appears that must be grabbed within the remaining time. Donkey Kong smashes into a barrel. The third and final section of the level features peg boards ranging from large to small and single pegs. Some of the pegs boards move. In the middle of the section above two of these moving peg boards is another Flitter. A tire is placed on the left and right side of the area near this foe. Farther above in the level are some barrels containing bananas and big peg boards that move up and down at a slow speed. Three Flitters fly around them. To the left and right of these peg boards are tires that the Kong can bounce on, while above them are two more moving peg boards. These boards are followed by three more pegs and a stationary board of pegs that is located right next to the exit. Above this peg board is a barrel that can be broken open to reveal a bronze DK Coin.